Dr Mahathir said he didn’t trust THAT guy. Was he right? Former prime minister Dr Mahathir Mohamad today described Group of Eminent Malays (G25) member Tawfik Ismail as someone ‘not to be trusted’ and carries ‘bad intention’. He expressed his puzzlement over Tawfik’s intention to meet him with the group when the latter disliked him so much. Tawfik goes on the attack! Tun Dr Mahathir Mohamad should not be talking about trust as he had failed in many ways, the son of a former Deputy Prime Minister said. In an exclusive interview with the New Straits Times, Tawfik Ismail said the former premier had betrayed the trust of the Malays when Umno was declared unlawful. The G25 member said that it was an excuse to reconstitute Umno so Dr Mahathir could exclude and include certain personalities. “I think that is a big betrayal of trust,” Tawfik was quoted as saying by the English daily. Dr Mahahthir, he added, damaged the judiciary and that, too, was a betrayal. The judiciary, the son to Tun Dr Ismail Abdul Rahman said, was not as independent as it had been before the late former Lord President Tun Salleh Abas. In 1988, Salleh as Lord President had written to the King on behalf of all judges expressing disappointment over Dr Mahathir’s accusations against the judiciary. He was subsequently suspended and sacked by a tribunal chaired by Tun Hamid Omar who later became Lord President. Tawfik’s comments come a day after Dr Mahathir said the former was a man with bad intentions and should not be trusted. 1MDB critic and former prime minister Dr Mahathir Mohamad’s pet projects lost more money combined, compared with the RM42 billion of debts racked up by the state investment firm, said G25 member Tawfik Ismail. Tawfik said he told Mahathir this when Mahathir reached out to the group of eminent Malaysians ‘between March and April’ this year, to recruit them for his campaign to oust Prime Minister Najib Abdul Razak. “(He) talked again about the money purportedly lost in 1MDB. “However, I told him again that if we look back at the present value of what Dr Mahathir had lost during his time as prime minister, I am sure the amount of money would be more than what was alleged to be lost in 1MDB. “He kept quiet after that,” Tawfik said in an interview with the New Straits Times today. He said Mahathir’s legacy, however, is a legacy of ‘betrayed trust’. This includes compromising the judiciary and concession agreements which are now burdening Malaysians. “It seems that many things that we are paying for is because Dr Mahathir had allowed for a non-transparent way of operating. Dr Mahathir Mohamad says the son of former DPM Tun Dr Ismail Abdul Rahman, has bad intentions and is a hypocrite. KUALA LUMPUR: After being accused by Tawfik Ismail of attempting to play a de facto prime ministerial role, former premier Dr Mahathir Mohamad has said the man has bad intentions and should not be trusted. Speaking at a press conference after delivering a keynote address at an anti-corruption event here today, Dr Mahathir said he had always known Tawfik disliked him although the latter was somewhat hypocritical about it. Tawfik is the son of former deputy prime minister, Tun Dr Ismail Abdul Rahman. “I know he doesn’t like me. Why he should come and see me with the others is something beyond me. Obviously he comes with very bad intentions and these kind of people, we cannot trust. 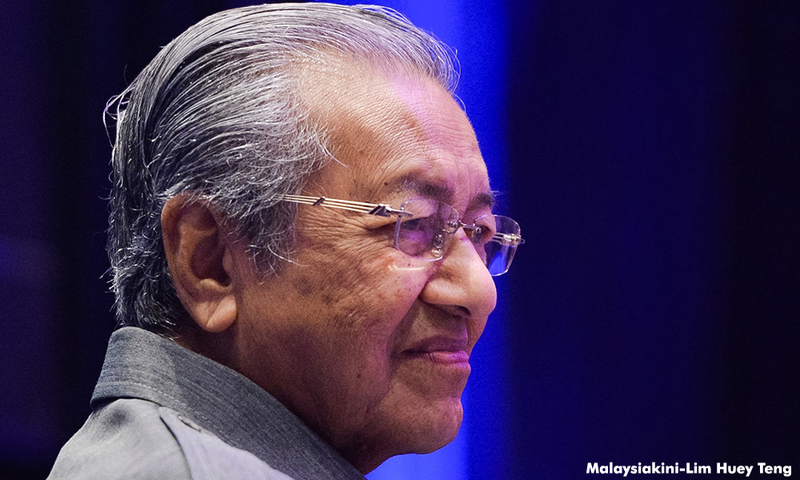 “In front of me, he was nice, he even appeared to be supportive but when he went out, of course it was a different matter,” Mahathir said of the meeting Tawfik had with him and the G25 Group of Moderates earlier this year. This entry was posted in G25, mahathir, tawfik and tagged G25, mahathir, Tawfik. Bookmark the permalink.